Called “the minimalist shot heard ’round the world,” Steve Reich’s 1971 masterpiece Drumming is, like several of the revered composer’s works, pretty much exactly what its title promises. The four-part piece, which Reich will perform on July 31 at Maverick Hall with percussion groups NEXUS and So Percussion, utilizes eight small tuned bongo drums, three marimbas, three glockenspiels, two or three female voices, and one whistler/piccolo player to conjure a tour de force of hypnotic, austerely augmented beats. It’s also the last of Reich’s major works to explore the phasing concepts of his earlier compositions like Piano Phase and Violin Phase (both 1967). Lore has it that Drumming draws on the music of master Ghanian players, but, according to the work’s creator, that’s not entirely accurate. Although after Drumming Reich largely bid adieu to phasing, the approach continues to stand as one of his trademarks. The technique calls for two main players (or one player and a recording) to repeat a single pattern in unison, usually on identical instruments; one musician changes the tempo slightly while the other remains constant. Eventually the two players will be out of sync with each other, sometimes by several beats, creating the phased effect. Depending on the piece, the musicians either continue or phase the music even further. After La Monte Young and Terry Riley, Reich, who was born in New York and raised there and in California, is considered the third pioneer of minimalism. Following his tutelage by Berio and Darius Milhaud and work with the pivotal California Tape Center, Reich shook the avant-garde with his use of phased tape loops on such compositions as It’s Gonna Rain (1965) and Come Out (1966). His later key efforts include the self-explanatory Clapping Music (1972); his most seminal work, Music for 18 Musicians (1974); and the Grammy-winning Different Trains (1988). 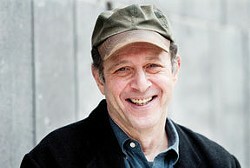 Among Reich’s numerous awards is a 2009 Pulitzer Prize for Double Sextet (2007). Formed in 1971, the four-member NEXUS has performed around the world and has a repertoire ranging from 1920s ragtime to works by Reich and John Cage. 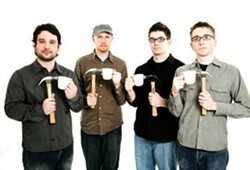 The Brooklyn-based quartet So Percussion began in 1999 and features rock-reared players. Reich calls the troupes “two of the greatest percussion ensembles on Earth.” Seeing them in action along with the minimalist master will bring maximum thrills. Steve Reich, NEXUS, and So Percussion will perform to celebrate the 40th anniversary of Drumming at Maverick Hall in West Hurley on July 31 at 8pm. The perfromance is a benefit for the Woodstock/Byrdcliffe Guild. Tickets are $100 for the first three rows, including a pre-concert dinner with musicians; $60/reserved seating; $20 general admission under the tent. (845) 679-2079; www.woodstockguild.org. Adam Sliwinski, Jason Treuting, Josh Quillen, and Eric Beach of So Percussion. The ensemble will be performing Steve Reich's Drumming at Maverick Concerts on July 31.